Jaipur was to be the last Indian city we would see on this (very short) tour before heading back to Kolkata for another wedding. 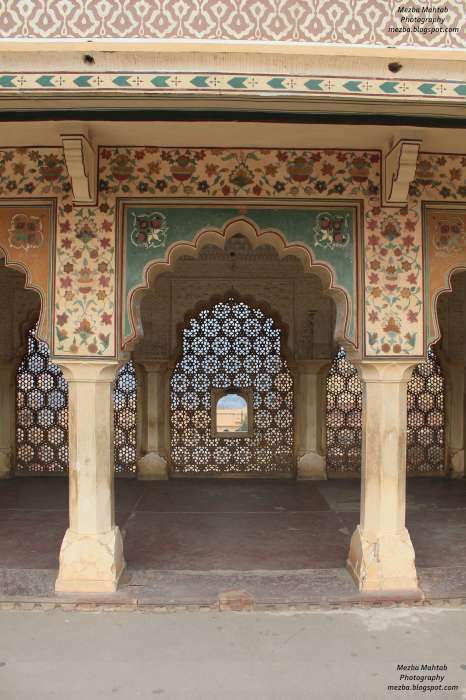 We only had three days, so we spent one in Delhi, one in Agra, and now one in Jaipur. Even though Jaipur is only a 4 hour ride away from Delhi (same as Agra) we had chosen to fly. Why? 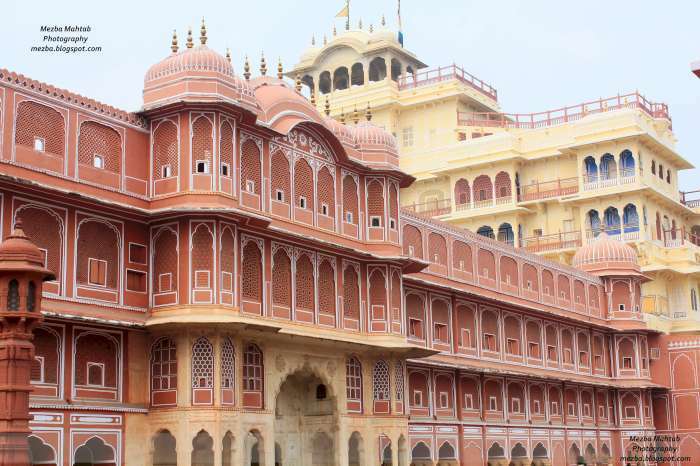 Well, when I booked the tickets, booking the flight from Delhi-Jaipur was just CND$10 more. And boy, were we lucky! The day we were supposed to travel to Jaipur, there were some protests around Delhi (over the price of onions!) and the onion farmers and resellers had completely blocked the highway from Delhi to Jaipur, even the rail tracks, so the only way to go there was by flight! Lots of people at the airport, trying to get last minute tickets, and here we were, having tickets by chance! This, being India, things are of course never smooth. You have read of our "adventures" boarding the Kolkata-Delhi flight. Here, we were barely on time, and made it past security. So there we were, sitting on the plane, when the pilot announced there was something wrong with the plane, and they are going to, believe it or not, "reboot". And for some reason, the metal in the terminal was "interfering" with the readings (I think the pilot was a Dell technician in his previous life), so the plane was going to be towed to another location, and we all had to exit the aircraft. Long story short, 2 hours later, we got another aircraft (thank God), and were finally underway, and reached Jaipur around 10.30 in the morning. And here is one thing you have to know. The Indian exchange rate to the Canadian dollar is AMAZING! 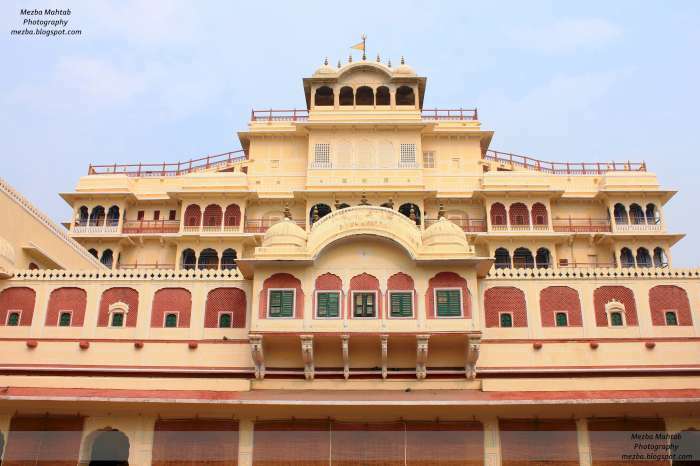 We were in the top luxury hotel in Jaipur, and it cost only $90 a night. This is five star luxury. The wife went for a spa treatment at the hotel with the works - it was $20. I booked a whole day's taxi for 8 hours - $40. A four course meal sent up to the room - $10! 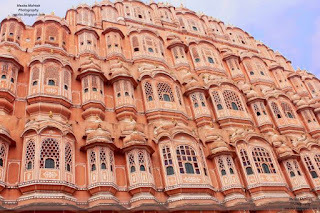 Our tour started with the beautiful Hawa Mahal (Wind Palace). The original intention of the 700 or so windows was to allow royal ladies to observe everyday life in the street below without being seen, since they had to observe strict "purdah" (face cover). 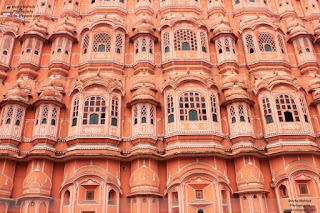 This pinkish colour of the bricks, present throughout EVERY house of Jaipur's Old City, behind the walls, is what gives Jaipur its nickname of "The Pink City". It is something to see, where EVERY building is the same colour and quite old. 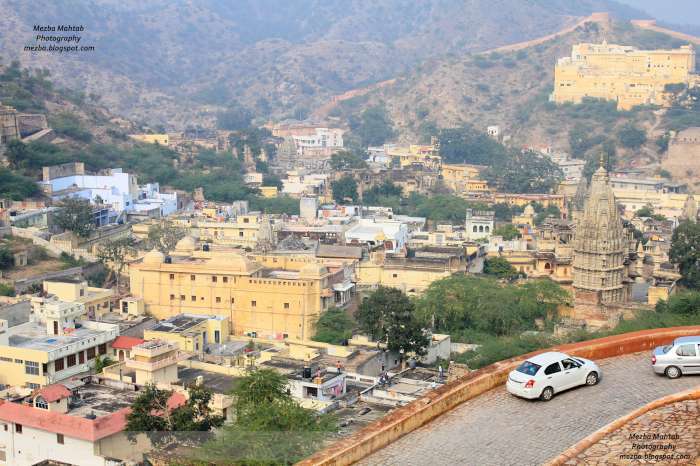 Jaipur was also quite dirty - which was surprising after the clean Delhi. 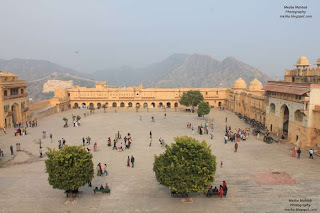 Perhaps Delhi was cleaned up for the Commonwealth Games 2010, but there were lots of tourists in Jaipur, and it was a shame they had to see the magnificient ancient stuff amidst dirty, really dirty, streets. Rubbish was scattered beside each street, flies were buzzing around and people just threw their litter wherever they wished. Thanks to the strikes and blockades of the highway by the onion protests, there wasn't too many tourists in the city which made our visits really pleasant - none of the places were as crowded as they should have been. Our next stop was Jantar Mantar. 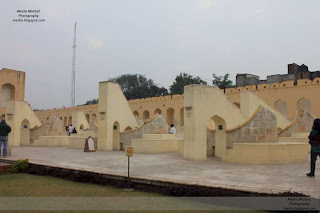 These are observatories made for the study of the heavens. As an amateur astronomer, it was fascinating. You don't need to spend a lot of time here, but it's something unique. There were structures made parallel to the earth's longitude, stairs that pointed north star, etc. 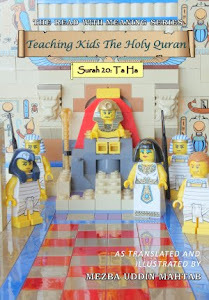 As usual, I have posted a lot more pictures on Facebook. Right next to Jantar Mantar was the City Palace, our next stop. 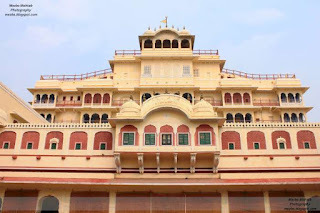 It was the seat of the Maharaja of Jaipur (he still lives there!). It also houses a big museum. Do these walls look familiar? The Bollywood epic Jodha Akhbar was shot on location in this city. 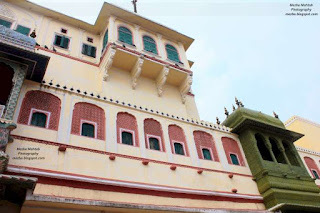 The vibrant colours of the palace reminded me of the multi-coloured houses of Venice. 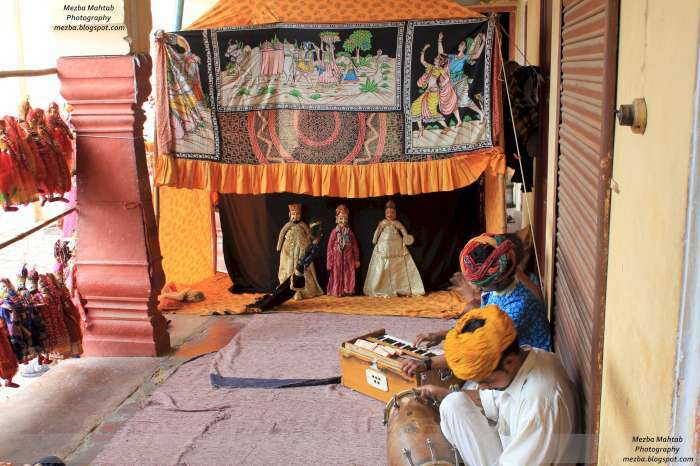 A traditional puppet show in City Palace (traditional, yet they had a Michael Jackson puppet!). Our next target was Amber Fort (also known as Amer Fort). 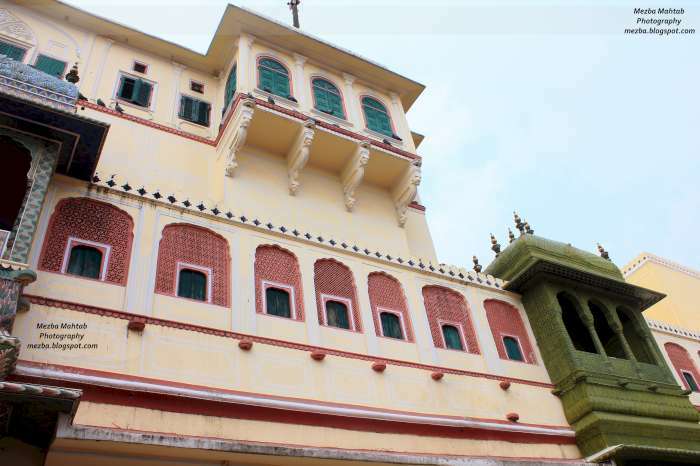 This is where Jodha Akbar was primarily shot - and it's a bit away from the city. 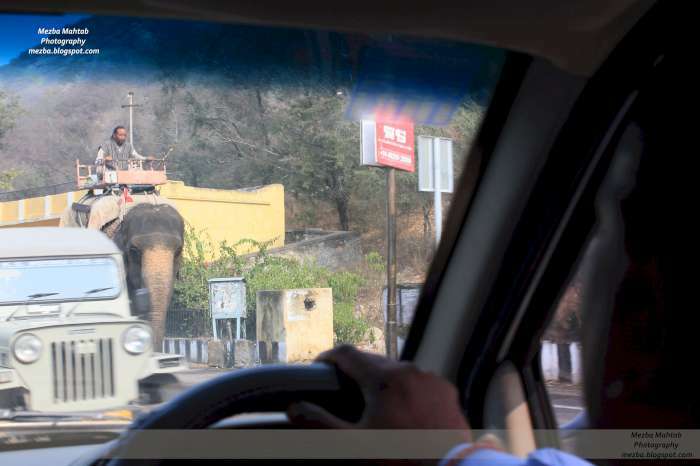 We had to share the road with elephants! 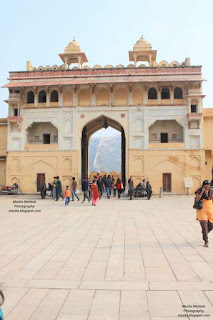 Amber Fort is known for its artistic style, blending both Hindu and Mughal elements. The fort borders the Maota Lake. Courtyard of the palace. The song "Azim-o-shaan Shahenshah" was shot on location here. 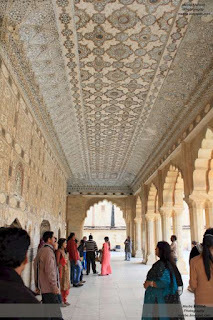 Sheesh Mahal (Palace of Mirrors) - a section inside the fort full of mirrors of intricate design and artwork all across the walls (and ceiling). 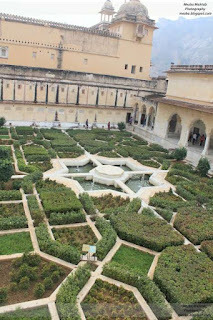 A garden where the Head Queen used to relax with her maidens and sing songs for the Maharaja (or so the guide told us). A window where the Head Queen used to sit and watch the goings on in the courtyard while observing "purdah". 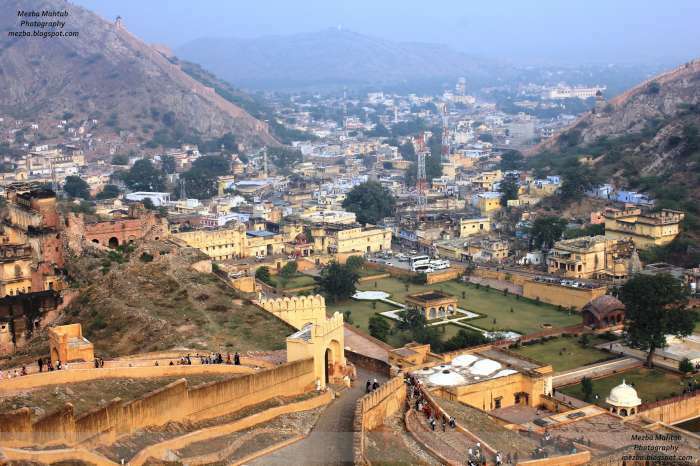 A view of the city below from the Maharajah's chamber. Traditional Rajasthani bangles sold in what was the Royal Kitchen. 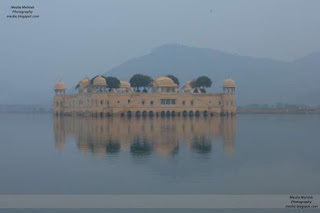 Our final stop of the day was Jal Mahal (Water Palace). The idea of visiting it in the evening was to see the lighting that makes for nice pictures. Unfortunately, like many areas of India, it started to get shadier and shadier as darkness grew, so after waiting sometime we decided to retire to our hotel. We only caught the beginning stages of the lighting (pictures on Facebook), but it was still a nice sight. Overall Jaipur was a nice stop. 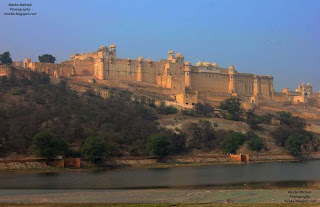 Many tourists do the whole Rajasthan trip, which includes Udaipur, Jaisalmer and few other cities (particularly for fans of the Satyajit Ray movie Shonar Kella). If we had time, I would also have done the same. It could get repetitive, with same type of fortresses, palaces etc. so you have to mix up your itinerary. You don't really need to book via a group travel agency, as everything is online and hotels take care of everything. However you have to stay in the top hotels which has the good facilities suitable for Westerners, otherwise Jaipur can be very backwards. Once back in our hotel, they put on a Rajasthani dance show for the patrols, as well as a cultural show; not to mention a palmist - which every hotel had. Overall, our stay in Jaipur was a very pleasant one. Fantastic pictures (as usual)! 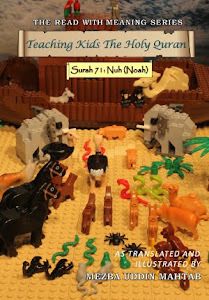 Love this post the best out of your recent series. What a great deal you got on that five star hotel! Thanks for sharing your trip, Mezba. 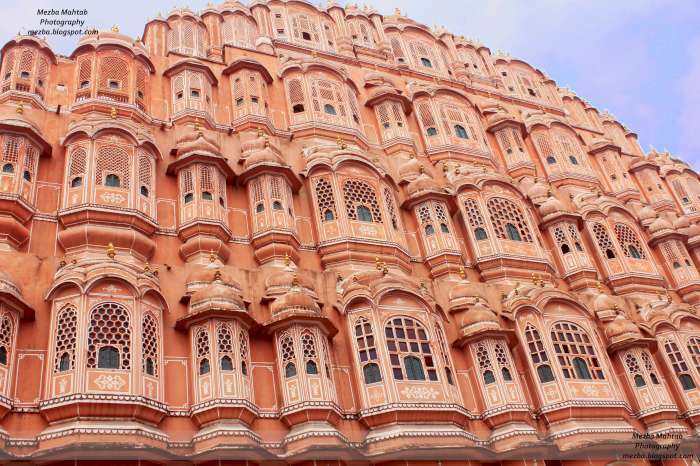 I'm fascinated with the Hawa Mahal. I recall reading about the onion shortage. I think they actually imported onions from Pakistan at the time to alleviate the crisis. And it IS a real crisis if a huge portion of the country cooks daily meals with onion as the backbone of many dishes. 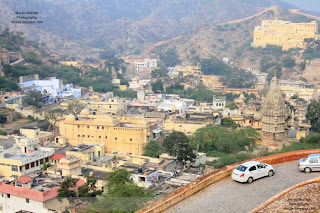 I love beautiful and hectic Jaipur. What an amazing city. Your photos are so great, nice job with the pics. @Farah, thank you. 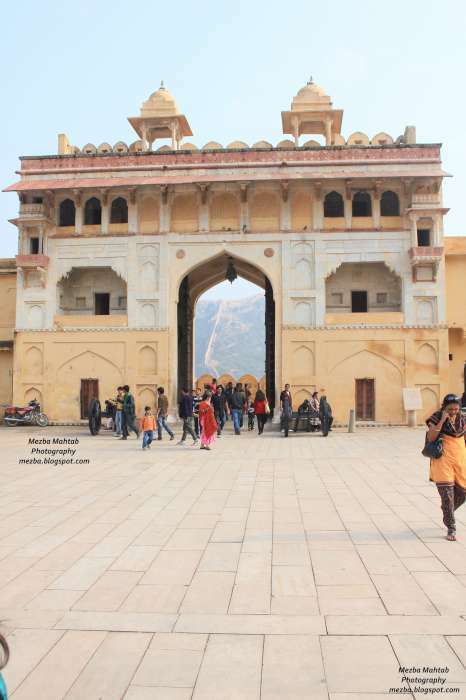 Personally I liked visiting the Taj, but I think from a photography perspective I liked Jaipur. @Tauqeer, yes, when I heard the price in rupees it was a lot ... but then upon converting...! :-) I think as a Pakistani there might be visa issues too, I had to apply for an Indian visa and they have a whole separate form if you are a Pakistani! 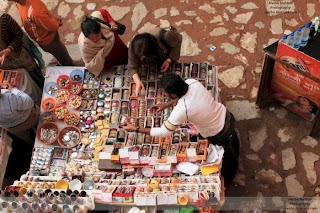 I also think I got some type of deals as I went after Christmas and it was a light tourist season (due to the temperature which in Jaipur wasn't too cold though). @Nadia, it was a great deal, and I had only booked it 5 days prior to travel! I hadn't spoken to ANY one on the phone, just online, and even asked for an aiport pick up (coz it was so cheap!) but was secretly worried whether the online transaction had gone through - thankfully it did. Regular prices at that hotel seems more expensive now - we were there JUST before New Year's and it seemed not the usual tourist season. Nadia, have you visited Jaipur? @Lucky Fatima, yep when I mentioned this story to my white friends one was like - well who strikes over onions! But if you are Indian (or even desi) it's a staple food that you use in everything! 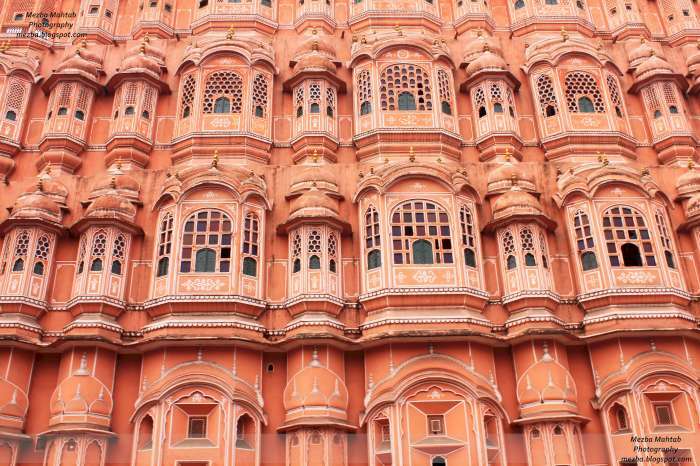 Jaipur was really nice, and we were able to do everything in one day (and still have time for that spa thing lol). 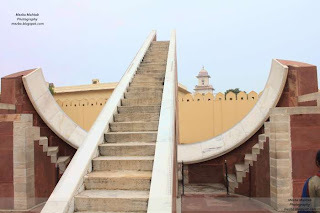 Very interesting to know about Jantar Mantar and the inclusion of a Michael Jackson puppet is amusing.Thank you for sharing.Really enjoyed this post! Love the exchange rate, sounds amazing for the price! @Lat, thank you Lat. Yes, the Pink City is kind of unique - I have never seen anywhere else thtat the whole city is coloured with one colour. I think Indians use garlic and onions in everything! 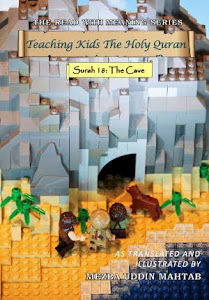 :-) You can tell from the bad breath of some people at the mosque after Iftar lol. @Liya, there were elephant rides in Jaipur close to the Hawa Mahal. It's very unique ride, because of the way they stand up and suddenly you are up so high! I should post some of those pictures sometime. Oh yes, the exchange rate and low costs in India were a blessing. In Dhaka and Dubai, things were pretty expensive even after you convert. @Azra, thanks! Oh yes, definitely houses nowadays are on the less showy side. Sigh.